The Singapore Health Promotion Board (HPB) is offering a 5-week internship during the year-end vacation period. Established in 2001, the Health Promotion Board (HPB) has a vision to build a nation of healthy and happy people. Although residents in Singapore today enjoy good health with high life expectancy and low mortality rates, we want to further improve our health status and continue to enjoy good health as we age. To achieve this, HPB assumes the role of the main driver for national health promotion and disease prevention programmes. Our goal is to increase the quality and years of healthy life and prevent illness, disability and premature death. To know more about this opportunity and to apply – Click here. The Department of Japanese Studies turns 30! The Department of Japanese Studies was founded in 1981 and turned 30 this year. 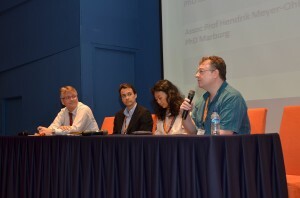 The Department celebrated the occasion with a research symposium, a ceremony and a reception on 28 October, 2011 at the NUS Alumni House. The research symposium was chaired by Assoc Prof Thang Leng Leng and featured four colleagues from the Department of Japanese Studies as speakers. Assoc Prof Simon Avenell demonstrated how the volunteerism after the recent Tohoku tsunami and earthquake could build on experiences from previous events. Dr Timothy Amos introduced his research on the outcast communities in Japan and Assoc Prof Lim Beng Choo looked at Chinese influences in Japanese Noh Theatre. Finally, Assoc Prof Hendrik Meyer-Ohle discussed the dynamics in Japanese retailing and consumption based on a case study of a provincial city in Japan. 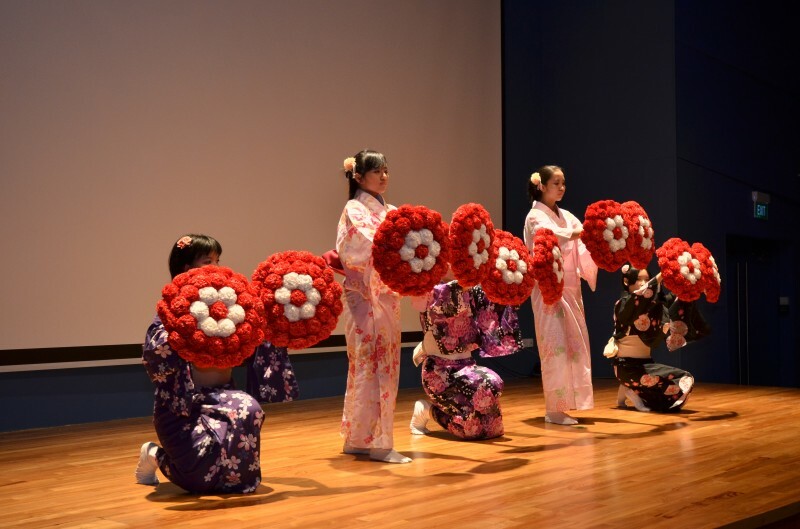 Anniversary Ceremony was opened with a dance by the Department’s Buyo group. Prof Brenda Yeoh, the Dean of the Faculty of Arts and Social Sciences, in her welcome address, stressed the significance of Asian Studies for NUS with Japanese Studies playing an important role. Minister and Charge d’Affair, Mr Hiroyuki Yamamoto, from the Embassy of Japan in Singapore congratulated the Department and noted the changing interests of students and staff with regards to Japan over the last 30 years. 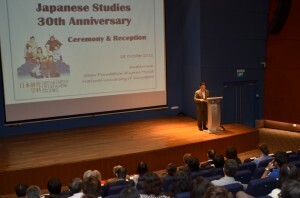 Assoc Prof Hendrik Meyer-Ohle, Head of the Department of Japanese Studies, expressed the Department’s gratitude to Japanese institutions, the Japanese community in Singapore and the University for their continued support. He also commemorated the occasion with the launch of the Japan@NUS network, an initiative that brings together academics at NUS with links to Japan. The members of Japan@NUS are introduced on a new website (www.fas.nus.edu.sg/jps/japanatnus.htm). Finally, Ms Sia Sheau Chwen, President of the Alumni Association, remembered her days in the department and acknowledged how the education received in the department has contributed to many successful careers of alumni. The ceremony was followed by a reception that allowed current colleagues and students of the department to reconnect with its alumni and its many friends from NUS and the Japanese community in Singapore. Guests were also treated to a tea ceremony conducted by the Department’s Sado Club. Recently, one of our FASS students Christel Quek was featured on the US news blog Huffington Post mentioning the contributions of women who helped influence social networking. These passionistas celebrate true value in their work, and drive tirelessly towards their ideals while also balancing them with sheer motivation to influence others with their humanitarian causes. Christel is one of only 40 women featured for their individual passions and is a prime example for creating success in our endeavours. Christel is currently a third year Geography major in the National University of Singapore and is also a social media architect for Havas Media, one of the largest communications groups worldwide. Her work focuses on social media networking through digital marketing strategies. She also does freelance photography and graphic design for NUS-related and NUS-partnered events that includes Arts Camp 2010 and Singapore Model United Nations Conference 2010. 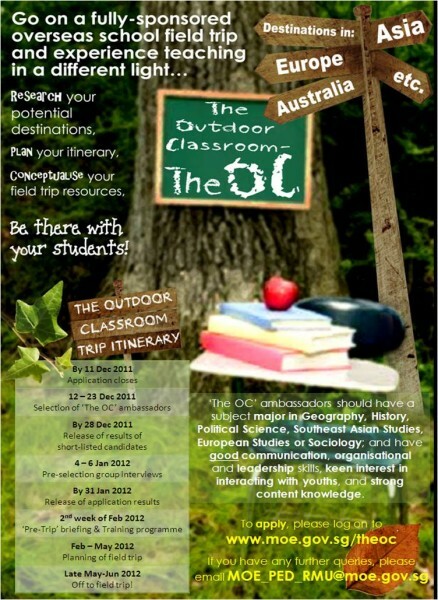 MOE – The Outdoor Classroom 2012! Experience teaching in a different light by being involved in the organisation of an overseas school field trip to destinations in Asia, Europe, Australia, etc… Your entire trip expenses will be fully sponsored! Eligible only to subject majors in History, Geography, Political Science, Southeast Asian Studies, European Studies or Sociology. You should possess good communication, organisational and leadership skills, have keen interest in interacting with youth, and strong content knowledge. APPLY at www.moe.gov.sg/theoc now! Application closes on 11 Dec, Sun. The biennial Goh Sin Tub Creative Writing Prize was established by Dr Sylvia Goh with an endowed gift to the Department of English Language and Literature at the National University of Singapore in memory and recognition of her late husband, Goh Sin Tub, who was one of Singapore’s best-known local writers. 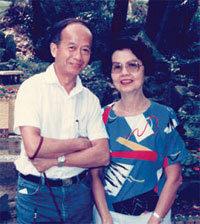 Goh Sin Tub and Dr Sylvia Goh are both alumni of the University of Malaya (UM), one of NUS’ predecessor institutions. The Prize commemorates Goh Sin Tub’s life, achievements and support for education. The genre for the Inaugural Competition is short stories. Subsequent competitions will feature other literary genres. The competition is open to all members of the NUS community at the time of submission of entry. In total, fifty-nine qualifying entries from 43 participants were received in this year’s competition. For more details, click here (http://www.fas.nus.edu.sg/ell/docs/GST_CW2011_Results.pdf). Loh Guan Liang is an English Literature Honours (2009) alumni. He is the Winner of the Moving Words Poetry Competition and is currently a Sec 1 Teacher at the Canberra Secondary School. Are you tired of sitting quietly in big lectures without an opportunity to speak out? Do you feel the need to interact with others and become a more effective communicator? learn for the real world through a “hands on” problem solving & proposal process. By the end of the course, you will be able to plan, construct and express nonverbal and verbal messages clearly and convincingly that are fitting to audience, context and purpose. 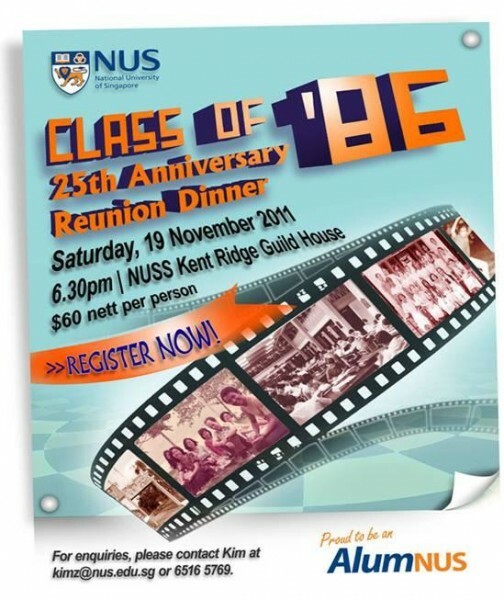 The Class of ’86 is celebrating their 25th Anniversary reunion on 19 November 2011, 6.30pm at Shaw Foundation Alumni House. On behalf of the organising committee, we would appreciate if you could help to disseminate or inform relevant alumni from the cohort about the event and come forth to join us. Alternatively, they may contact Ms Sim May Kim at kimz@nus.edu.sg or 65165769. 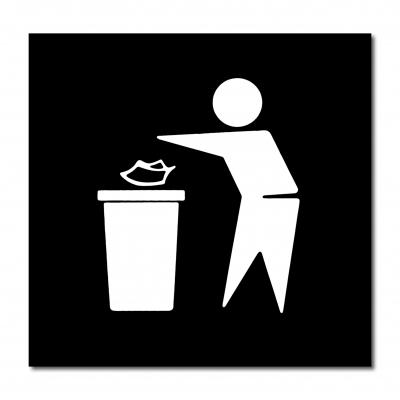 In a study commissioned by the National Environment Agency (NEA), researchers from the Department of Sociology headed by Assoc Prof Paulin Straughan found that increasing the number of bins was the most effective way of reducing littering. The least effective? Banners and signs reminding people not to litter. 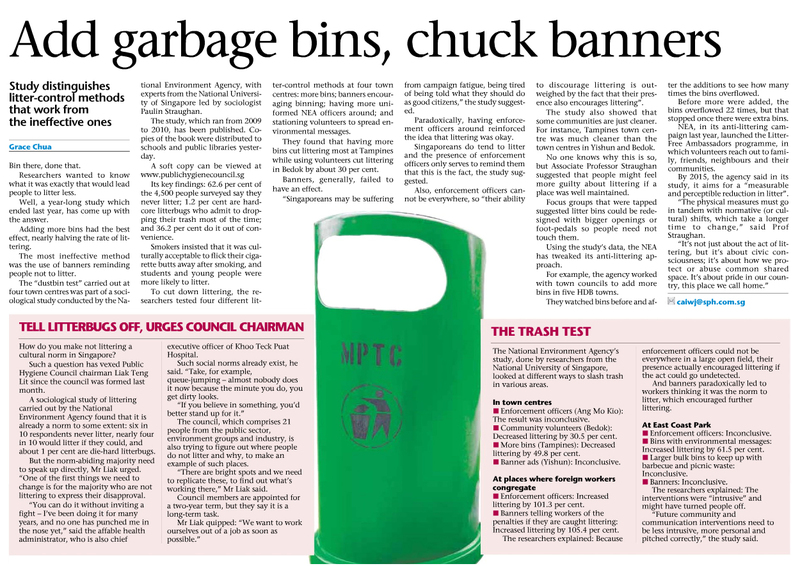 The study, which ran from 2009 to 2010, looked at different ways to slash trash in various areas which included town centres, places where foreign workers congregate and at East Coast Park. The findings of the study were published in a book titled “Towards a Cleaner Singapore” which was showcased at the launch of the Clean and Green campaign on 29 October 2011. In addition to the publication, a new anti-littering campaign was developed and launched in 2010 based on the findings and recommendations of the sociological study. Other than Assoc Prof Straughan, the team of researchers included Assoc Prof Narayanan Ganapathy and Dr Daniel Goh from the Department of Sociology. Click here to read the coverage of the study in The Sunday Times (29 Oct 2011). The soft copy of the book can be found here.